Step 1: Paint a coat of neon paint on top of base coat. 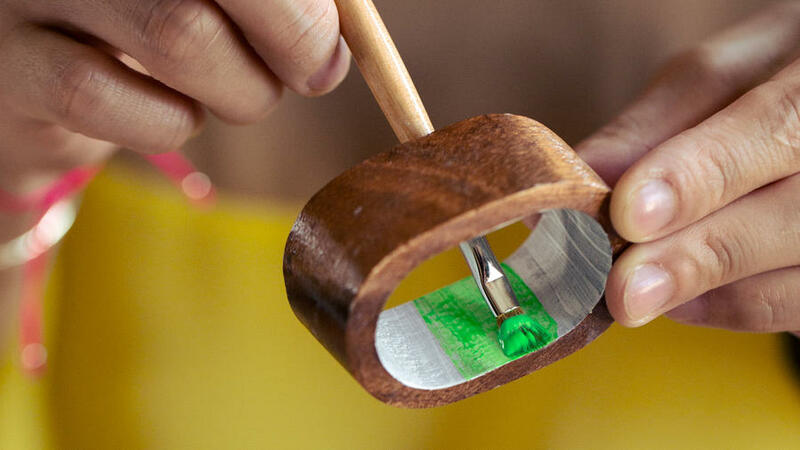 Put a ring on it–a hand-painted wooden napkin ring, that is. 1. Paint interior of napkin ring with a base coat of white acrylic. Let dry. 2. Paint 1 coat of neon paint on top of base coat. Let dry and repeat. 3. Print chevron template. Cut out template, wrap it around napkin ring, and use a tiny piece of clear tape to secure ends together. 4. Position pieces of painter’s tape along edges of the template. 5. Remove the template so only the painter’s tape remains. 6. Paint the exposed wood with a base coat of white acrylic. Once dry, apply 2 coats of neon paint in a color that contrasts with interior. 7. When completely dry, remove tape. Project by Grace Lee, who started crafting jewelry as a second career. She brings her love of patterns to these napkin rings.